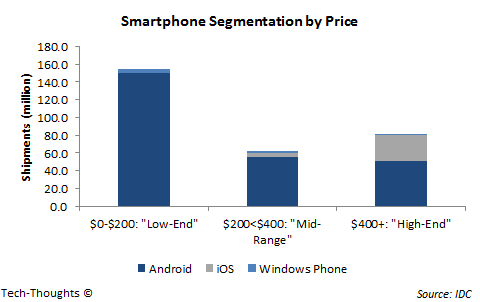 IDC announced their smartphone shipment estimates for Q2 2014 last week, but the chart above seems to have captured all the attention. Regular readers may already be aware that I am a proponent of usage-based segmentation, rather than price-based segmentation. However, data can always be useful when interpreted correctly. This makes more sense. Smartphones priced below $200 make up more than half the smartphone market, and Android has a 97% share of shipments in this bucket. Devices priced at $200-$400 make up a shade less than a quarter of the market, and Android has 88% of this bucket. Finally, devices priced above $400 make up a bit more than a quarter of the market, with Android accounting for about 62% and iOS accounting for 36%. Of course, this is a snapshot of a single quarter and iOS' share of devices priced >$400 could be above 50% closer to an iPhone launch. It is important to understand that these price buckets aren't really "market segments" -- What makes a $400 Samsung device any more "high-end" than a $200-$300 ("low-end" or "mid-range") Xiaomi device? Five years ago, most smartphones were priced well over $400 and lower priced devices were effectively "feature phones". At that point, the consideration set for buyers would be devices in a narrow price bucket. The subsidy model in mature markets narrowed this consideration set even further. But today, it is possible for consumers to buy a better device (measured by the ecosystem, user experience or specifications) for about half the price. Thanks to Moore's law and Google's licensing model, device capabilities have become good enough even at lower price points. Therefore, the consideration set for a buyer covers a much wider price range (except for a niche, luxury segment). While this is especially true in emerging markets, the changing nature of smartphone subsidies has also played a part. In other words, based on IDC's definitions, "low-end" devices are now competing with "mid-range" devices and "mid-range" devices are competing with "high-end" devices.